First Communion is a further step towards Full Initiation, after Baptism, for children in the Latin Rite/Roman Catholic Church. Full Initiation is completed with Confirmation. For a young person under ten years of age, it is a momentous stage in his or her spiritual development, and deserves to be celebrated as such by the child, the child's family and the community in which the child lives. Can we be confident that the profundity yet simple nature of the ceremonies involved, will be preserved for future generations, in the face of growing challenges to our faith and our way of life? The primary focus of First Holy Communion is the reception of the Body of Christ by the child for the first time; and, on the continued growth of the spiritual life of the child. The First Holy Communion and Confirmation ceremonies are important days – landmark days – and should be memorable, proud and happy occasions for the child, her/his parents, grandparents, sponsors, brothers, sisters, classmates and schools. However all the pressure of trying to make these sacramental days special for the child can cause parents a lot of stress. Bishops, priests and schools are very concerned about the cost issue facing parents with children for First Holy Communion and/or Confirmation and have discussed this matter in parishes. If the emphasis for sacramental preparation is placed on commercially related concerns, rather than on the spiritual significance of the sacrament, then it is not a good preparation for Catholic children. How different was it in the past? In a recent discussion, one person recounted his experiences of making his First Communion and First Confession in Ireland, in the early 1960's. He was perhaps surprised himself that his memories were essentially of his preparation for the receipt of the sacraments, and (but only with the aid of a practically sepia-toned photograph supplied by his mother) his very first suit especially purchased by his parents for the occasion. Mentioning his suit, triggered a wonderful memory from his wife of a white, ribbon-laced dress, for her special occasion, supplied by her paternal grandmother. The teachers, clergy and parents who prepared a child for the receipt of First Holy Communion and First Confession over fifty years ago succeeded wonderfully in their devotion to the cause. Of course, being brought up for those first seven or eight years with stories and teachings from the bible, was an immensely important schooling in itself. It needed to be. For a young person to fully comprehend and accept that he or she would be 'eating of consecrated bread and drinking of consecrated wine... the body and blood of Jesus Christ' Himself, was a development of colossal significance in his or her spiritual and personal life. They were taught to cope with it magnificently. Equally important was the need to be 'considered to be without sin and in a state of grace', before receiving the sacrament of the Holy Eucharist. To achieve that state, the little child received the Sacrament of Penance, by making his First Confession, a week before receiving his First Communion. He had to recall whatever sins or misdeeds he had committed in his young life to date, before he could be absolved of sin, ready for receipt of the Eucharist. There had to be a racking of brains to come up with a viable list of 'sins' for the First Confession, in the confines of the dark, wooden confession box, before the awesome personage of the Parish Priest, who was really representing the presence of God. But once the young child had admitted his failures and had received his penance from the priest, who was immensely understanding it seemed, he left the box feeling relieved, but renewed. At last came the wondrous occasion of First Holy Communion Day, when a small number of innocent boys and girls, seated together, held the attention of all the worldly congregation. 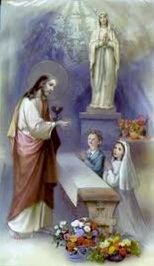 On the day of the First Communion, he had to fast for the night before receiving the sacrament. He was reminded that drinking water or taking medicine, were exceptions but he was warned, again, not to use his tongue or his finger, to remove the host from the roof of his mouth, should it stick there. That the majesty of the occasion, centered around the further initiation of innocent, pure souls into their faith, was in itself hugely important in fortifying and underscoring the beliefs of the rest of the congregation. Of course, there were a few shillings, florins and, heavens, the odd half-crown, forthcoming from genuinely delighted parents, relations, friends and neighbours, afterwards. And most of these, did indeed end up in a tattered post-book, to buy an umbrella for the foretold rainy day. But there were no bouncy castles, or large parties, or first mobile phones, playstation games etc. The child's parents wore the best that their existing wardrobes could offer on the day, and expenses were kept to a minimum. How have things changed!? The world in 2014 is more advanced in so many ways, from the simpler, more basic times of the 1960s. The concept of 'modern technology' has invaded all aspects of our existence. Most of us, though, are still firmly rooted to planet Earth and space travel for the average man and woman, if anything seems to be even more unattainable. On the day, the miracle that is the receipt of First Holy Communion by young children, absolved of their sins, remains at its heart, intact. Thankfully, schools and teachers continue to play a significant part in the preparation of the young persons, in the progression of their Faith. But there are greater challenges for Catholic institutions, endeavouring to exist in a climate which 'must' include greater diversity. 'Policy' now exists regarding the Sacraments of First Communion and First Reconciliation, in response to the new pastoral situation and by way of enacting the vision of Share the Good News, the Irish Episcopal Conference's pastoral plan for the Irish Church. Tellingly, the document accepts that the 'foundation of children's experience of faith in the home and the parish...can no longer be presumed'. This apparently places or has placed the schools in a role far beyond what was previously expected. The response is to ensure a greater role by the parish community in the preparation for and celebration of First Communion and First Reconciliation. Parents are affirmed as the 'main agents' inviting and accompanying their children on their journey and the school continues to be the main resource assisting family and parish. The practical implementation of this policy has resulted in consultation, planning and meetings between all parties involved, from early in the school year. Perhaps it is most evident to the 'independent parish observer' - not just in Ireland, but in other countries where the Catholic Faith remains strong - in an increased number of Sunday Masses, focusing on the children and their parents. Some parents may rightfully feel that they continue to provide the foundation of the experience of faith in their family home. This will be obvious to the teachers and the parish priests and should not go unnoticed. However, they may not be immune to the pressures placed on other parents, as recognised by the Catholic Church in Ireland. As previously stated, trying to make these sacramental days special for the child can cause parents a lot of stress. If the emphasis for sacramental preparation is placed on commercially related concerns, rather than on the spiritual significance of the sacrament, then it is not a good preparation for Catholic children. Before we judge parents too harshly, we should understand, and we do, just how difficult it would be for the mother and father today, to extricate themselves from the many tentacles of commercially related social necessities that have wrapped themselves around the Holy Sacraments. You could go 'on-line' and purchase a dress for as little as fifty euro; or a suit for as little as seventy euro. However, you may more likely be forced to consider the 2014 collection from Jacadi Dublin, for your little daughter; or your little niece or grand-daughter, because gift tokens are also available. Just how much you spend there, may well depend on what you intend spending on your own outfits, which could be more than that you would spend on your child. Overall, parents could find themselves spending 713 euro on the occasion, and sincerely believe that it was well worth the money. Although, if you were some of a small number who had to borrow over 500 of that from a bank, you might not think so, several repayments later. However, perhaps your son or your daughter could advance you a loan, as some of them apparently receive in excess of 400 euro on the day. Perhaps not, though, as they may be more likely to spend a good part of that on video games, toys and clothes. Earlier in his homily of May 25th, on the Gospel reading from Mark 10, in which the disciples rebuked people who were bringing children to Jesus, the Holy Father recalled the occasion when he was coming out of the city of Salta, on the patronal feast. His entourage encountered a humble lady who asked for a priest's blessing. Despite the fact that she had attended Mass, she had another necessity: the need to be touched by the Lord: the 'words' that she had heard in the mass, had not registered with her. It reminds me of my own daughter, who made her First Confession, in her school classroom, in 1994. The little girl was very upset, because she felt she hadn't received the sacrament. To that innocent child, she felt the need to be touched by God's forgiveness, in the confessional box, in the church, before the priest. No policy ends with preparation, or even implementation. It must be constantly reviewed and renewed; kept alive, like the natural progression of faith towards the next important step. After First Communion, young Catholics must attend church every Sunday, and they are encouraged to receive confession and communion frequently, even weekly. That the emphasis for sacramental preparation is placed on the spiritual significance of the sacrament. That the sacraments are not to be viewed as 'decorations' or rites of passage. “They are to give us strength of life. That children receiving the Sacraments will recognise Jesus Christ present in the Eucharist and will walk with Him the rest of their lives. For all who prepare children for the Sacraments, that God may bless them for their good work. A shilling in old Irish money was worth 12 pennies then; or 5 cents today. A florin in old Irish money was a two-shilling piece; or 10 cents today. A half-crown was worth two shillings and six pennies; or 12 1/2 cents today. The Journal.ie - Poll, Is 713 euro too much to spend on your child's First Communion Day?